Did You Know Botox Can Repair a Gummy Smile? 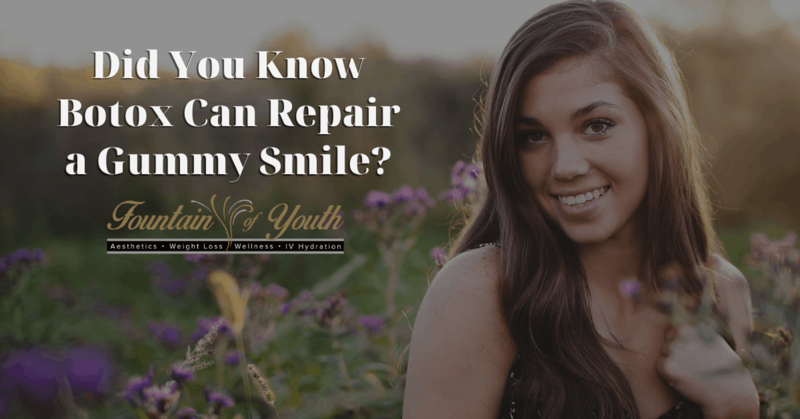 Did You Know Botox Can Repair a Gummy Smile? For women and men, a smile is your biggest asset. It opens doors, shows how you feel and can even brighten another person’s day. There are over 1 million dollars in products spent in the US alone to perfect smiles. With that, a smile showing too much gum is also a feature many people want to repair. A gummy smile is a smile in which too much of the upper gum is visible when you smile. There are a variety of reasons for a gummy smile. Sometimes, heredity simply provided an overabundance of gum space. Teeth may be a lot smaller in size and collectively than the gums, too. Another reason for a gummy smile is that the upper lip is drastically thinner, smaller or both as compared to both the gum and teeth region and to the lower lip. Whatever your “why,” gone are the days when you must just live with a gummy smile if it is something you’d like to improve upon. If you have a gummy smile, you will be happy to learn that there is a new solution. Botox is being used for millions of people who want a more uniform, natural-looking smile. Maybe you have heard of or read about Botox for use in other areas. For years, Botox has been the go-to choice for women and men of all ages. Botox improves the signs of aging and wear and tear of the environment and certain facial habits. Frown lines. “11s,” the vertical lines between the eyes that give that angry look. Wrinkles. Crow’s feet. Botox is widely used for other conditions, too. Migraine headaches. Even overly sweaty underarms (hyperhidrosis). So, it is easy to see the natural migration to the smile area for the Botox evolution. Your provider at Fountain of Youth Wellness will determine how many units of Botox you specifically need to help you meet your goals. How Does Botox Help a Gummy Smile? If your gummy smile robs you of your highest self-confidence, Botox can help. Gummy smiles come in all shapes and sizes. Client goals do, too. Because of this, we will partner with you to determine exactly how many units of Botox you need to meet your vision for a beautiful smile. Botox helps to improve a gummy smile by relaxing the upper lip region to cover the surplus of gum tissue. Ideally, an evenly proportioned upper lip covers enough gum to present a healthy smile with minimal gum tissue exposed. We mentioned a few of the reasons for a gummy smile. Based upon these reasons, we will personalize your perfect smile plan with Botox. Botox injections placed in the exact areas will relax the upper lip tissue, even out an uneven upper lip region and give upper lip lift for a natural-looking smile, too. You can count on Botox leaving you with a completely natural look. Botox is proven and safe. It is the trusted name in injections that women and men across all ages trust to boost self-confidence. And what better way to do that than with the best smile for you? If you want to book an appointment visit us at 6729 Spanish Fort Blvd. Ste BC in Spanish Fort, Alabama, call us at (251) 525-8446, or visit www.foywellness.com now! Shaving is so Last Year, Try Laser Hair Removal!